“I know I can do it,” Todd Downy said, helping himself to another ear of corn from the steaming bowl. Ahhh…love that movie and love this veggie! Roots that entwine so deeply into our collective ancestral memory that we can accurately describe this crop as ancient. “Columbus was one of the first Europeans to see maize or corn. The Pueblo Indians were raising irrigated corn in the American Southwest when Coronado visited in 1540. The settlers at Jamestown were taught how to raise it in 1608 and in 1620, it helped to keep the Pilgrims alive over winter. Corn cobs were found in Tehucan, Mexico that date back 7000 years.” Victory Seed Company. So it makes sense that the image of corn fields waving in the breeze evokes feelings in us all about connectedness to heritage, home and hearth and the ‘land ‘o plenty’. Have you tried to grow it in your garden? Well, if not, now is the time to try. You don’t need a “back 40” to grow corn. 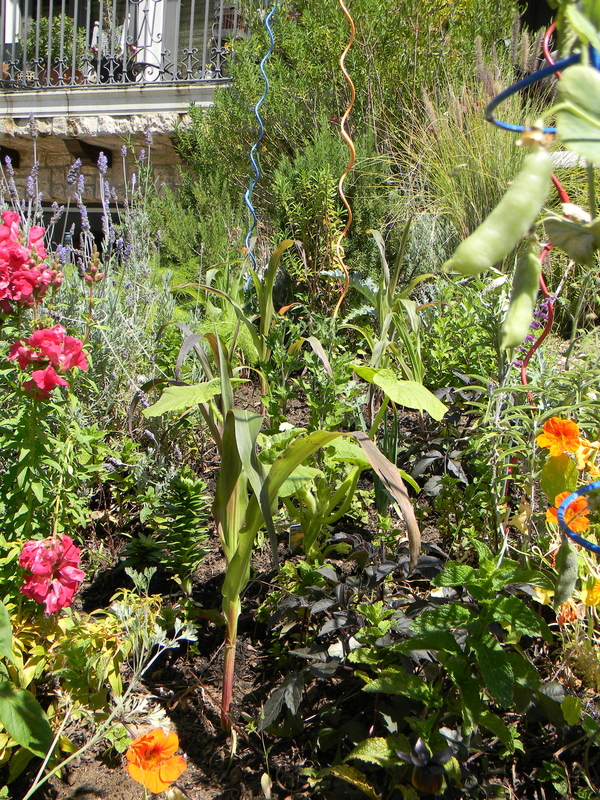 In fact, it is a beautiful addition to your edible landscape. Corn is a tall, annual cereal grass bearing grains or kernels. The genus comprises of four species out of which corn (Zea mays) is one of them. Zea mays Linnaesus is known as corn for the US and as maize for the rest of the world. Corn is the most important cash crop of the United States (60 percent of the world production). The center of origin of corn is believed to be Mexico or Central America. Corn was cultivated by the Indians in areas like New England with the arrival of the first European colonists whose survival depended largely on the corn food. 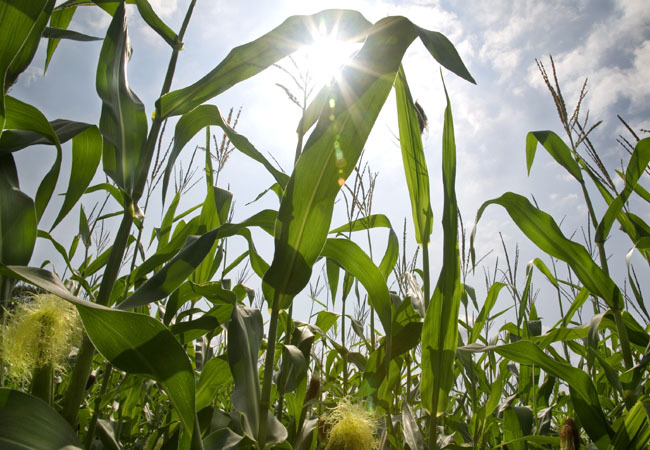 Corn is a warm-season crop that requires high temperatures for successful germination and growth. In general, sweet corn does not tolerate cold weather, and frost will injure sweet corn at any stage of growth. Extreme climate conditions like drought or flooding can reduce yields and cause ears to develop small and deformed. Because corn is a short-day plant, some cultivars will not flower when the day length is more than 13 hours. This is rarely a problem with commercially available sweet corn varieties in the Southeast, but gardeners should be mindful of day length when planting heirloom or tropical corn varieties. Sweet corn grows best in well-drained, deep, naturally rich, loamy soil. Sweet corn will adapt to a wide range of soil pH. The best growth is seen at pH 6.0 to 6.5. In choosing a site to grow corn, heavy clay soils with poor drainage and areas subject to flooding should be avoided. Dry, sandy sites should only be used if irrigation is available. Sandy soils are best for early crops since sandy soils warm up faster in the spring than heavy soils. Soil temperature should be between 70° and 85°F for best germination. If the soil temperature is too low, the seed will not germinate. If, at the same time, the soil is too wet, the seed may rot before the soil temperatures are adequate for germination. Use a probe thermometer, available at garden supply stores. Insert the thermometer to two inches into the soil for early season and small, seeded vegetables including arugula, fava beans, beets, broccoli, Brussels sprouts, cabbage, carrots, cauliflower, kale, leeks, lettuce, many of the oriental greens, onions, parsnips, peas, radicchio, radishes, spinach, Swiss chard and turnips. Insert the thermometer four inches for warm season vegetables such as tomatoes, eggplants, peppers, cucumbers, squash, corn and melons. Take the temperature at the same time each day for several days in a row and average them out. The best time to take the temperature is mid-day. If you can’t take the soil temperature each day, agricultural weather reports give out soil temperature information taken mid-day. Corn is a fairly heavy feeder so I recommend that you TEST YOUR SOIL for fertility and amend for any deficiencies before you plant. Adding at least three inches of good quality organic compost a couple of weeks in advance is always best. In the absence of a soil test, apply 3 to 4 pounds of an organic 12- 12-12 or similar analysis fertilizer per 100 square feet to establish a good basic fertility level. Side-dressing with an organic high nitrogen fertilizer like blood meal starting when the plants are about 2 feet tall is also recommended. Be careful when applying blood meal as too much will burn your plants. Nitrogen deficiency is fairly common in corn, particularly in cold, wet soils; flooded soils; or dry, sandy soils. Nitrogen deficiency in young plants causes the whole plant to be pale with spindly stalks and yellow leaf tips. In older plants, nitrogen stress is often shown by shriveling of tip kernels. Having said that, I pull back on the N side dressing when ears start to form as I find continued application of N at this stage diminishes the corns flavor. Stay on top of your fertility because once stunted by lack of nutrients, corn may never fully recover. Commonly used organic sources of nitrogen, phosphorous, and potassium are blood meal (~15% N), bonemeal (~4% N and 21% P2O5), and soybean meal (7% N and 2.3% K2O). Many gardeners choose to use poultry litter or commercially available poultry-litter based products. For example, a 3-2-3 or 3-2-2 poultry litter product can be applied before planting. A blended fertilizer or bonemeal mix (10-10-10) can also be used. A liquid fish-emulsion and seaweed product (average analysis of 4-1-1) may then be used for sidedressing. I stress that just by adding organic matter such as well-rotted manure or compost to the soil you will increase the level of nutrients, improve soil microbial activity, and increase water-holding and nutrient-holding capacity. Organic matter also improves the physical condition or texture of the soil for cultivation and improves soil structure so the surface of the soil does not crust. Any soil can be/should be improved through the addition of organic matter. As HGEL has often advised, cover crops are also an important, inexpensive way to add organic matter to the soil, and much of corn’s N needs can be met via cover cropping. Plant Spacing for small gardens: In areas with unlimited space, sweet corn is usually spaced 10-15 inches apart within the rows, with each row about 36-42 inches apart. A common mistake made by home gardeners is to plant sweet corn in only one or two rows at a time. This typically results in poor pollination and low yields. Sweet corn grows best when planted in several short rows instead of one long row. Corn has male flowers on top of the plant and female flowers called silks at leaf axis along the main stem. The tassel can produce up to a million pollen grains. Pollen moves by wind and gravity, so single rows of corn don’t pollinate and produce as many ears of corn as do rows side by side. If you’re planting small quantities of sweet corn or don’t have the space for long rows, you can plant in rectangular blocks that consist of a minimum of three rows (although I’ve done two rows closely planted with good results). Plant the seed about 3-4 inches apart in the row, and space the rows 2 1/2 to 3 feet apart. After the plants are up, thin them to 12 inches apart. If planted too close together (< 1 foot), the corn will have small, poorly filled ears. In small areas having limited space, but with good soil moisture and organic matter, it is possible to plant double rows that are 10-12 inches apart with 30-42 inches between each double row. Plants within each row are spaced about 12 inches apart. Planting at these spacing will provide good pollination, good air flow and good yields as long as the blocks are no more than three or four sets of double rows wide and proper moisture, nitrogen and weed control are provided. This method offers the most efficient use of the garden area. Otherwise plan on spacing the plants 1 foot apart within the row, and the rows about 2-3 feet apart. 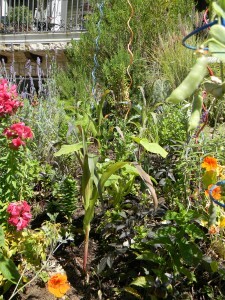 Isolation: Most gardeners know that sweet corn may not be as sweet if it crosses with field corn. Likewise, some of the supersweet or extrasweet corns may not be as sweet if they cross with other types of corn or even with other supersweet varieties. Corn varieties can be prevented from crossing by isolating them from each other. They can be isolated by either planting them 100 yards or more apart, or by timing plantings so each variety sheds pollen at a different time. It is also a good idea to isolate different sweet corn types from each other, unless the effects of crossing them is established. Irrigation: Corn needs a continuous supply of moisture to ensure pollination and growth of kernels in the ear. After the tassels are produced, sweet corn requires 1 to 1.5 inches of water each week. Gardeners will find that soaker hoses laid on the soil surface and covered with an organic mulch or drip irrigation is the most efficient way to irrigate. Whatever method used, a gardener should never allow the soil to dry out. It takes consistent, adequate moisture from silking through kernel fill to ensure high yields of high quality ears. Check the amount by catching it in cans placed throughout the watered areas if using overhead sprinklers or by digging down to see if the moisture has penetrated at least the top 6 inches of the soil. Common recommendations are that suckers should not be removed from the base of the corn plant. It has been reported in many vegetable production publications that their removal does not increase yield or ear size and that removal may actually reduce yield and consume valuable time. Reports from both Clemson University (2002) and Colorado State University (2004) support this recommendation. Weed Control: Weed control is one of the most difficult management problems facing organic vegetable growers. Before planting, weeds can be reduced through use of crop rotations and cover crops. Try to rotate crops with different growth habits, warm and cool season crops, and crops grown in wide and narrow rows. On small plantings, organic mulches, such as straw or grass clippings, can help shade out weeds between the rows. Native American corn was the genetic foundation of all other corn varieties. “Indian” corn is rarely grown in the garden today. Most people now associate corn for eating with modern sweet corn varieties that incorporate specific genes to increase or enhance sugar quantities and shelf life. Other types of corn can be eaten like sweet corn when it is young, but are usually grown to maturity, dried and used for flour and meal. Corn is probably the most diverse grain crop. Both man and nature have selected traits that can roughly be classified by the characteristics of their kernels — flint, flour, dent, pop, sweet, and waxy. Flint corn is mostly hard with smooth, hard seed coats. Flour corn is soft and starchy with thin seed coats. Dent corn has hard “flinty” sides with soft starchy cores that allow the ends to collapse or “dent” when the corn dries. Varieties of dent corn are the most widely grown types in the Unites States and used for oils, syrups, grits, meals, flours, and silage. Popcorn is one of the oldest forms of corn and can be generally classified into two types — pearl or rice — based on the physical shape of the kernels. Sweet corn is mainly grown for fresh consumption and not used for flour or feed. A variety named ‘Papoon’ was raised by the Iroquois in 1779. Golden Bantam, a variety that we still offer, was released in 1902 and has been popular ever since. By the way, the “baby corn” that you use on salads are simply immature, unfertilized ears that have been harvested and sometimes pickled. The su type is the old-fashioned sweet corn with which we are all familiar. It must be consumed quickly after harvest, or the sugars rapidly turn to starch. The se types contain more sugar than the su type and, if cooled, will remain sweet for several days after harvest. The sh2 type also contains more sugar than the su type but converts very little sugar to starch. If properly cooled, an sh2 variety will remain sweet for 7 to 10 days after harvest. The sy type is a hybrid comprised of 75% se and 25% sh2 kernels, resulting in an ear with the sweet and tender characteristics of the se type but with the shelf- life of the sh2. Many organic growers prefer the following cultivars. ‘Platinum Lady’ (se) and ‘Bodacious’ (se) are good early-season sweet corn varieties. ‘Silvarado’ (se), ‘Kandy Corn’ (sh2), ‘Argent’ (se), and ‘Snowbelle’ (se) are excellent mid-season varieties, and ‘Delectable’ (se), ‘Pegasus’ (sh2), and ‘Silver Queen'(su) are good late-season white corns. In a crop-rotation study (J.M. Davis, unpublished), ‘Silver Queen’ exhibited very little earworm damage, probably because of the tight tips on the husks. During the early 1990s, an organic growers network in New Jersey, Connecticut, Massachusetts, and Vermont recommended ‘Silver Queen’ (su) (because of consumer name recognition and earworm resistance) and ‘Snowbelle’ (se) as good white corn varieties for organic growers. For an early-season yellow corn, they suggested ‘Sugar Buns’ (se). ‘Bodacious’ (se) is a favorite early to mid-season yellow, and ‘Clockwork’ (se) is an excellent mid-season bicolor in that part of the country. Varieties for the new sy type include ‘Renaissance’ and ‘Nantasket (early season), ‘Montauk’ and Bojangles’ (midseason), and ‘Providence’, ‘Cameo’ and ‘Charmed’ (late season). In addition, improved sweet corn hybrids are being introduced every year, especially se, sh2, and sy varieties, with improved disease resistance and seed germination. There are many more varieties available. Check with your organic seed company for varieties that are recommended in your growing zone. More information on Sweet Corn varieties. Please note that you should be careful to avoid genetically modified varieties of sweet corn. These varieties are transgenetic, for example, containing the Bt (Bacillus thuringiensis) gene. The use of GMO corn is not approved for organic production. In an organic system pest management is based on prevention. The goal is to have a healthy, balanced plant and soil system in which pest populations will be stay within tolerable limits. In a conventional system, synthetic pesticides may help a grower save the current crop from an immediate pest problem; however, in many cases, the problem recurs or another develops. The organic approach is based on the theory that major pest problems usually occur when something is out of balance in the system. Although there are several corn diseases of concern, there are many sweet-corn cultivars available with resistance to the major diseases. Whenever possible, a gardener should select marketable cultivars with disease resistance to fit his/her specific needs and conditions. Stewart’s bacterial wilt is sometimes a problem in the mid-South. Early-infected plants wilt and die. Later-infected plants are stunted and contain yellow streaks on the leaves. The disease is spread by the corn flea beetle, especially after mild winters. New cultivars resistant to Stewart’s wilt should be used if early sweet corn is to be planted where flea beetle populations were high the previous year. Get regional information on IPM from your regional IPM center using the link provided below. A Word about the Integrated Pest Management (IPM) approach. This is system is well-suited for organic production and one, as a Master Gardener, I always recommend. IPM is a system in which insects, diseases, and weeds are closely monitored, and different methods are used to keep pest populations at levels that are not economically damaging with minimal adverse environmental effects. IPM encompasses use of cultural and biological control methods, use of resistant varieties, and judicious use of pesticides. When pesticides must be used, an effort is made to select ones with low toxicity, non-persistent residues, narrow spectrum of control, and low environmental impact. Harvest: Each sweet-corn plant will produce at least one large ear that should be harvested at prime maturity, when the silks are dry and brown and the ear has enlarged to the point that the husks are tight. This stage is usually 17 to 18 days after silking under warm day and night conditions, or 22 to 24 days after silking during cool weather conditions. At harvest, kernels should be plump and exude a milky liquid when punctured (except for most supersweets with the sh2 gene where the liquid is clear). This stage only lasts 4 to 5 days, so the corn must be checked and harvested frequently. Sweet corn is removed from the plant by simultaneously snapping and twisting the ear away from the stalk. To capture the sweetest flavor, pick just before preparing the dinner, or leave unhusked and refrigerate until cooking time. Corn sugar will start to turn to starch as soon as the ear is taken from the plant. If sweet corn is to be frozen or canned, it should be shucked, de-silked, and brought to a boil for a period of three minutes immediately after harvest. Cool it as rapidly as possible after boiling. It may them be either frozen or canned. Immediate processing this way reduces sugar loss and greatly improves flavor. Avoid holding sweet corn for long periods of time at ambient temperatures after it is harvested.